We like to do things a bit differently here in Redwood! You know the way so many people head off to Europe, especially Germany, for the Christmas Markets? Well, we do the opposite! Today, we took our German guest to two local Christmas Markets. To say, she was surprised is probably a bit of an understatement. Her comment was ‘the Irish are always thought of as always drinking’… yet, at these markets today there was no drink. We’ve never been to a German Christmas Market but we are told they are all about mulled wine and food. There are so many markets on in the neighbourhood this year. Today, we visited Terryglass and Lorrha for their markets. We finished off our tour of North Tipperary with afternoon tea at Redwood Castle where we got a preview of what’s in store for next weekend’s inaugural Christmas Market that will run over two days 8th and 9th. They are promising a marvellous selection of craft and artisan producers from all over the country. Birr Christmas Market is also on next weekend. It is different opening times to Redwood Castle, so we should be able to get to both! On Sunday 16th we will have another market in Lorrha. Who needs to rack up the air miles, when you can drive a mile or two down the road to enjoy a market? We are only an hour from Galway or Limerick if you fancy coming to markets with a difference. And I should of course mention that we have limited bed and breakfast availability for these weekends too! Like many villages around Ireland, our local village, Lorrha, has been almost destroyed. There was a time, long before we came here, when there was I believe a cinema, 2 petrol stations, a post office and 2 pubs, and some shops in the village. By the time we came here in 2003, all that was left was the shop/post office and 2 pubs. Then the post office closed down, and it wasn’t long before the shop too closed its doors. However, not to be defeated by such things, a group of locals came together and formed a committee….. the result is we now have a community shop, run by a group of volunteers. It is not just a shop. It is a hub of community activity. It is a tea room. It is a tourist information centre. It is a craft shop showcasing and selling lots of creativity from around our area. Once again this year I thought of hosting a ‘coffee morning’ as part of the nationwide fundraiser for the Irish Cancer Society. Then I had a brainwave! Why host it at home, when it could be hosted in the community shop? I approached the committee, and they loved the idea. Volunteers were asked to bake and/or donate. The community came up trumps once again. Our hospice fundraiser was held this morning. People came in their droves to support and help, and guess what…. over €1,000 was raised on behalf of North Tipperary Hospice. How is that for an example of how a community pulling together can overcome challenges and bring lots of positivity into the neighbourhood? Well done to everyone, and major thanks from me to those I asked to bake, your help was very much appreciated. This is Lackeen Castle which can be seen in the distance from our kitchen….. but only as the sun rises and sets and reflects on the walls. To introduce you to my next Local Food Hero I had to be careful to make sure it was a Tipperary based hero! Trust me living in the country, county borders are of grave significance – especially at this time of year when we are in the thick of the All Ireland Hurling and Football finals. I would surely run the risk of excommunication if I did not introduce you to a Tipperary Food Hero. Michael Seymour of Sheepwalk Farm was probably one of the first local producers we met when we moved here 10 years ago. Michael sells organic beef and lamb at Nenagh Market and directly to customers. The first thing that strikes you when you arrive at Michael and Olive Seymour’s farm is the fact that it right in the centre of town. Literally – right smack bang in the middle of Borrisokane. Walk less than 100 yards and you are on Main Street! I spent a couple of hours with Michael recently, and he explained to me that originally (and when he was growing up) the farm house was on Main Street! A number of years back he sold the house on Main Street and built a more modern home for his own family just behind the original house. The farmland still runs from the back of Main Street down to the river and beyond, which as Michael said “makes life very easy, if you’re out fencing and realise you’ve run out of nails – you just have to walk a few hundred yards to get some more”. So true! We’ve been there ourselves when it has meant a 10 mile round trip into town! Walking the farm is almost like a ‘who’s who’ history of Borrisokane. I loved listening to Michael give me the names of the different fields – there’s Slevin’s Callow, Gannon’s Callow, Mikey’s field and oh, and this one is ‘our’ field! That’s the Ballyfinboy River over there…. and there’s the Millrace that was constructed in the late 1800’s….. we built this bridge last year, it makes it much easier to move the lambs and sheep. Michael’s great-grandfather (who originally came from our own neighbourhood village, Lorrha) bought the farm on his return for America in the 1800’s. It is so unusual to hear of people returning, but he did and the land has been farmed in a traditional way by Michael and his ancestors, ever since. The farm has been fully organic since 1999, Michael explained that he didn’t like what he was seeing with the sprays and chemicals that were being used, and felt it just couldn’t be good for either the land or humanity. He has often been asked why he doesn’t have a denser stocking level, but he works with nature and knows what his farm will sustain. 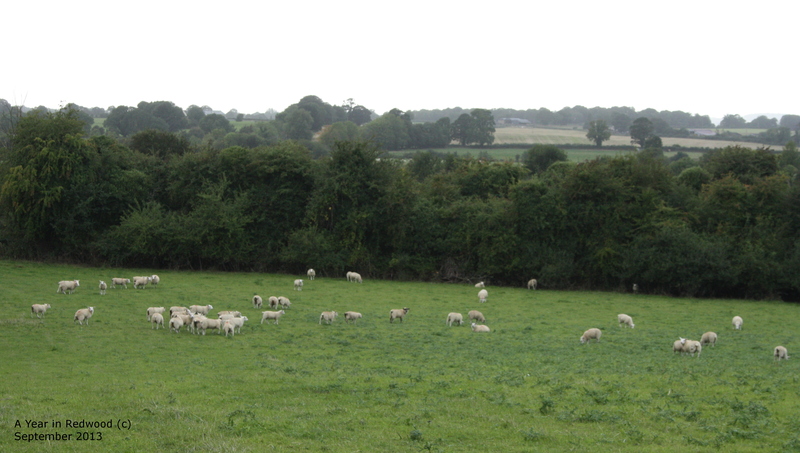 As part of the farm is ‘callow’ land it is not suitable to be used in certain weather. Michael has 20 suckler cows, 80 ewes and their respective offsprings on his 130 acres. With endless patience, Michael explained how his rotational system works. 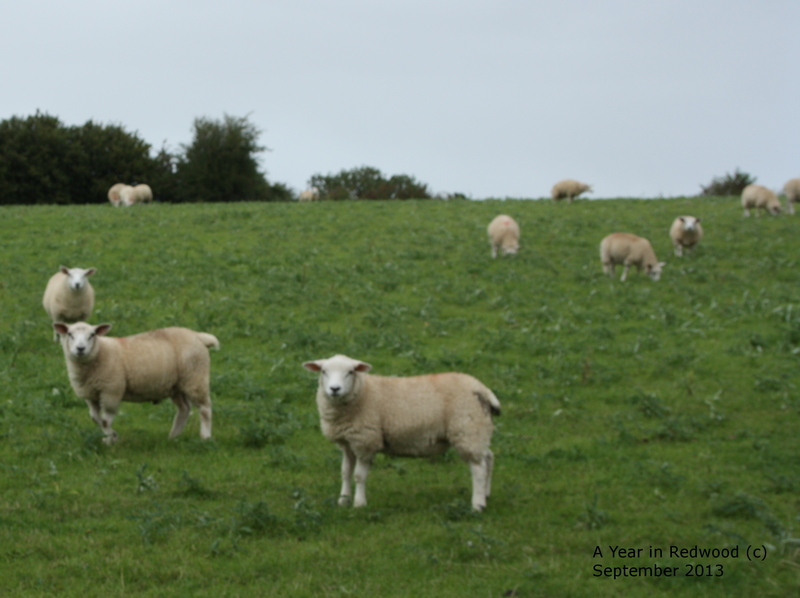 Lambs are grazed from March to July on same fields but from then on they graze on different fields, where lambs have not grazed before. As lambs graze fields the worm population grows but moving to fields not grazed previously by lambs should be clean grazing, that’s usually after grass. The cattle are generally moved indoors onto straw bedding by mid-November where they are fed farm cut silage. The sheep stay out most of the year only being brought indoors for lambing. However, their grazing is supplemented with organic nuts and silage over the winter. Fields are cut and grazed on alternate years, using a rotation system like this helps to naturally build up the soil fertility which in turn contributes to the preservation of the traditional grasses, clovers and herbs. As we walked and chatted, I was struck by the array of gorgeous sloes, blackberries, crab apples and haws in the hedges. There were tons of mushrooms and Michael said there are lots of damsons in the hedgerows on the farm too. I asked about challenges, like all other farmers, Michael said buying in feed and fodder this past year was extremely costly. He balked when he totted up the total!!! However, when I asked would he have chosen another life other than farming – his answer was a very definite No! We also chatted about ‘social media’. I know Michael uses Twitter. Why? Well, as Michael said, you have to know about these things – everyone else is at it so you need to keep abreast. I asked if he thought people’s shopping had changed in recent times? No, was Michael’s answer, he felt the shopping pattern changed seasonally….. more burgers and chops in the summer, more traditionally roasts and stews in the winter…. but business is generally remaining the same. Michael and his delicious organic lamb and beef can be found at Nenagh Market in Quintin’s Way, Nenagh on Friday afternoons and Saturdays 10 – 3 pm, or just give him a call to arrange delivery. 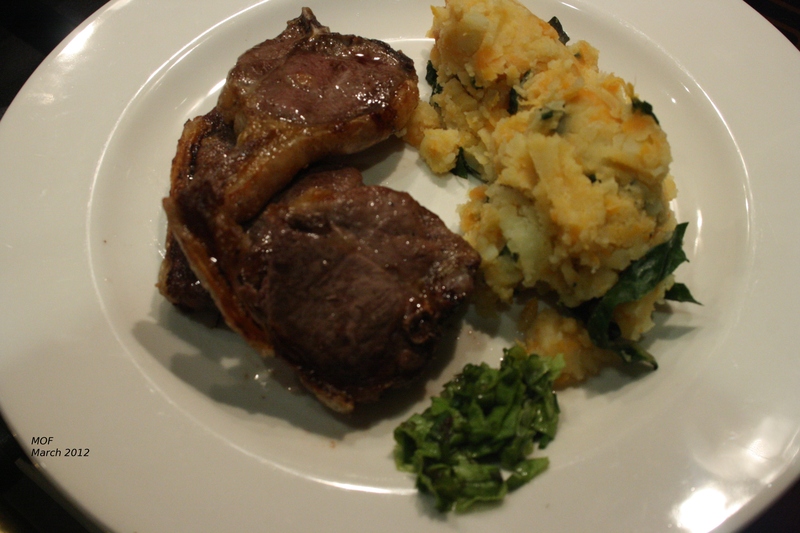 We came home from our visit to Sheepwalk Farm with some lamb and beef…. we’ve had the roast lamb – it is delicious…. the beef is being saved for a special occasion. Seymour Organics, Sheepwalk Farm, Borrisokane, Co. Tipperary. I lived in Dublin for a long number of years and never attended the St. Patrick’s Day parade. I remember going to the parade as a child living in Limerick. My memory is of it always being freezing cold and wet, and me wearing a scratchy wool/tweed coat. Fashion queen eh? Well, here in Redwood, the St. Patrick’s Day parade is a very serious event. There is mega competition between the two neighbouring villages and the floats! 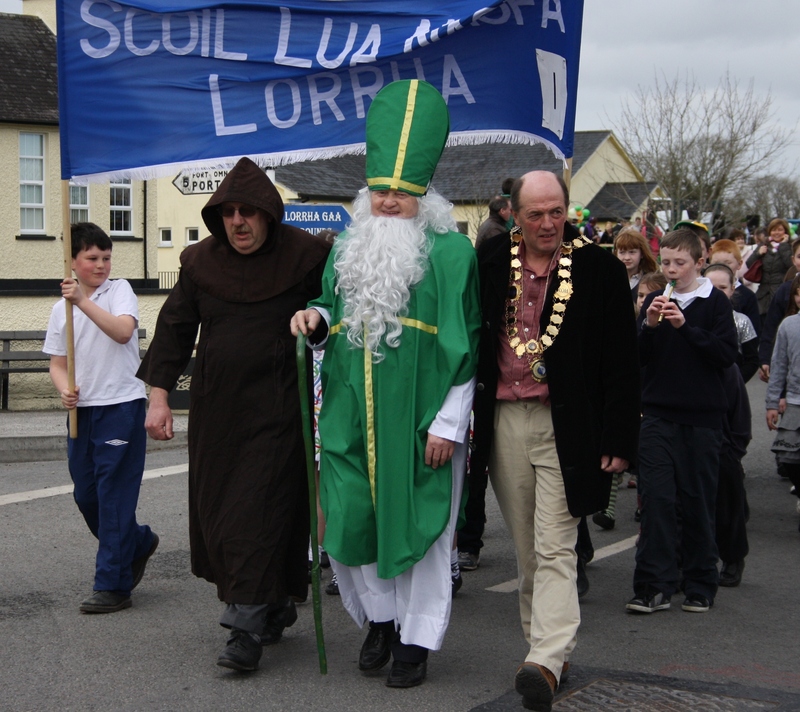 Our village of Lorrha (with an approximate population of 200 persons – and that’s in the parish, not just the village!) holds its very own parade every year, as does the village of Rathcabbin which is at the other side of us. So the drama groups, the schools, every club and business has its float. I counted over 20 floats in last year’s parade! This year I was approached by the drama group and asked to act as MC on their float – I’d better not reveal the theme yet – I could be extradited for that! Thankfully I graciously declined, cos next thing I was told that they had wanted me to do the whole MCing thing as Gaeilge (my Irish just ain’t that good)! I will go along to the parade though, as will everyone else in ‘the parish’ and I promise to take lots of photographs! I haven’t decided on dinner yet for the weekend…. but here’s a suggestion! My nieces and nephew aren’t too keen on spinach (about the only vegetable they don’t like), so this is how their Mum gets the green vegetable into them. Ireland Mash! Quantities will depend on how many you are catering for! Peel your potatoes, sweet potato or carrot. Boil your potatoes and carrots (or sweet potato). Steam your well chopped green vegetable. Mash your potato and mix your greens through. Et viola! Ireland Mash! We had it last weekend with Potato, Sweet Potato and Chard leaves. The last few days have been quite hectic! So much so that I have not had an opportunity to even turn on the computer not to mind write up blog! I travelled to Dublin on Thursday evening last in preparation for the presentation I had to make to the panel at National College of Ireland on Friday. This was the final part of the Entrepreneurship module I had started there in September. I had deliberated for weeks on what I would write the requisite Business Plan on, and in the end decided I should do it on Pigs and Pork and how we could develop a Pork Business here. I think the presentation went well and I got lots of great suggestions as to the direction that we should consider for the enterprise…. thank you to the members of the panel! So this week I will be doing some more research and checking out some of the websites they told me about. After the presentation, I drove back down home …. and then had to head back to Dublin on Saturday morning with pork deliveries. I had hoped that the butcher would have had meat ready for collection on Wednesday evening prior to my trip to Dublin, but unfortunately it was Saturday morning when it was ready. So once boxes were sorted, it was back into the car and off to Dublin with me again. Farmer Alfie could not do the run to Dublin as he was busy trying to finish off renovations to the livingroom in preparation for visitors coming for Christmas, and he was also the Stagehand for the Lorrha Amateur Dramatics group who had their annual play on over the weekend. However, it was a good trip – five deliveries to be made and all to new customers. That has to be good. It is especially good, as when we add in the local deliveries as well, we’ve once again been left with no pork for ourselves! Needless, to say, Farmer Alfie is quite disgusted that we have none left for ourselves – he is going to have to wait until after Christmas now for pork! At least we have some of our own ham for Christmas dinner….. at the moment anyway! By the way, the turkeys are putting on a nice bit of weight! So they should be good by next week! As I was trying to remember where I’d put something this morning, and pulling the place apart looking for it… I was reminded of the very first week we were here, and for some reason we had to go and sign some form or other at the local Garda Station. As you all are probably aware, rural Garda Stations are seriously under threat – in fact, we now no longer have our own Garda Station in Lorrha. However, back then in 2003 we did have a part-time Garda Station. In all the time I lived in Dublin, other than the Gardai I knew through diving, I can honestly say I never knew my local Garda, even when you consider the years that I was the key-holder for Clark’s house, and the number of late night/early morning alarm calls I answered. Anyway, that first week as you can imagine we were busy unpacking boxes when I suddenly remembered that we needed to sign this form. At the time the station was only open for a couple of hours on certain days of the week. And, of course, it was 5 minutes to closing time when I remembered we had this job to do. We both ran out and jumped into car. (I will admit we were rather scruffy looking!) Get to Garda Station and explain the reason for our visit…. we were asked for identification and verification of who we were… and then received a lecture for not having a driving licence with us as “it is an offence to drive a vehicle without having your licence”! However, it was OK for us to get back into car, drive the 2 miles back to the house and come back with the said licence! On our return… we were once again quizzed…. Alfie was behind me as we were quizzed, I was afraid to turn around at look at his face. One of the questions was “you both live in the same house and yet your surnames are different!” For those of you who know Alfie you can imagine what his face must have been like! We managed to sign the form, and left the poor Garda to work out how you can live in a house with two different surnames! A couple of months later, I had to renew the tax on my car, and pulled the house apart to find the tax book. At this stage I think we still had boxes that weren’t unpacked. I know there were boxes not unpacked coz we still have boxes of books that haven’t been unpacked! Despite the fact that I had diligently labelled all boxes as to what their contents were, no matter where I looked I could not find the tax book. So being the good person I am I completed the form for the renewal, wrote a nice letter explaining the situation to the car tax people telling them that I had lost my tax book in a house move. Seems perfectly plausible! BUT you have to get the form and letter stamped at a Garda Station! So this time, I thought I’d go to the Garda Station in Birr which would be like the HQ for Lorrha. Guess who was the Garda on duty – yes, my old friend! I decided to keep it simple and just ask him to stamp the form. Oh no, he had to read through everything and then started on at me that I couldn’t put on the form that my tax book was lost in a house move! I am standing there looking at this guy, and wondering is he going to give me an idea as to what I should say…. No, he just kept arguing that I couldn’t say this! Thankfully, for somewhere in the depths of the Garda Station (I couldn’t see who was even speaking) a voice boomed out “for God’s sake sign the form for the woman – it’s easily known you’ve never moved house! Hasn’t the woman been through enough!” It turned out to be the Sergeant who had moved house and knew the chaos that that involves! Since those first few months we have had 2 different local Garda based in the village and have gotten to know them. Only last year, when we were going visiting to Cadamstown on a dark, wet, winter’s evening, we came upon a Garda Checkpoint and were greeted with “Hi there Alfie and Margaret” – even though we couldn’t see the Garda’s face…. Does all this now mean we ‘are known to Gardai’. I wonder every time I hear those news reports!!!! BTW thank you to all who’ve left such nice comments…. it is great to get them – keep them coming, please!